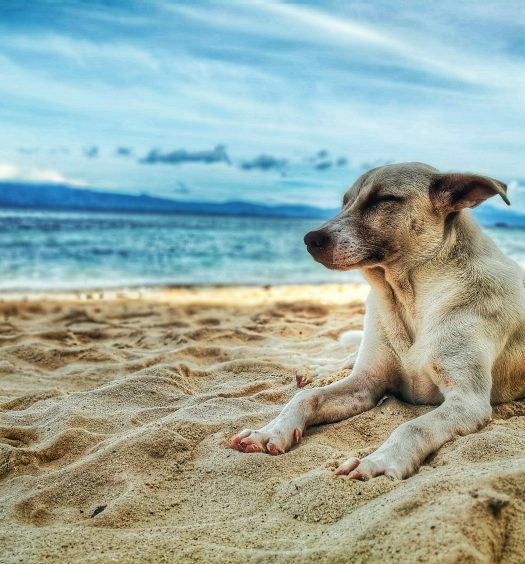 Looking For The Best Pain Reliever For Dogs? Here’s a look at our favorites, including our top pick – Vet’s Best Aches + Pains Dog Supplements. Aches and pains aren’t just a problem that only humans deal with. Mobility, vitality, and joint support are an important part of your dog’s happiness, and any decreases in these areas can negatively impact their quality of life. Over time, dogs can develop joint pain and sore muscles from constant running, jumping, and exercising. Years of wear and tear can break down cartilage and result in discomfort, instability, and decreased mobility. You may not be able to give your dog an aspirin from the medicine cabinet, but there are plenty of pet-safe pain relievers that you can offer your dog to reduce inflammation and ease their pain. Natural anti-inflammatories – instead of popping an aspirin, look for natural solutions with turmeric, white willow bark, MSM, pineapple bromelain, chondroitin, and glucosamine. These have natural anti-inflammatory properties to safely relieve your dog’s pain. 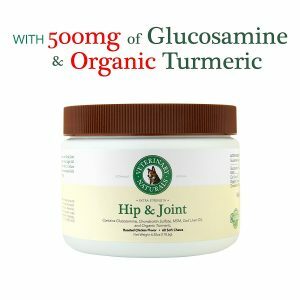 Glucosamine – this is a naturally occurring chemical compound in a dog’s body that fights inflammation and possesses anti-aging properties. As a supplement, it’s crucial in building and maintaining healthy joints. MSM – in addition to fighting inflammation, this natural sulfur compound helps to relieve pain and improve joint flexibility. Chondroitin – plays a big role in growing and maintaining healthy cartilage. It can naturally lubricate joints by attracting fluid to the surrounding connective tissues. Turmeric – on top of being a good anti-inflammatory agent, turmeric promotes a healthy heart, brain, liver, and joints. Aspirin – aspirin-based supplements will usually be the most effective pain relievers, but they can be hard on a dog’s stomach and digestive system. Use these sparingly. Powdered supplements – I’m not the biggest fan of powdered supplements, as they often harden into clumps and smell terrible. It’s definitely a personal preference, but I’d personally recommend going with chewable treats and tablets instead. 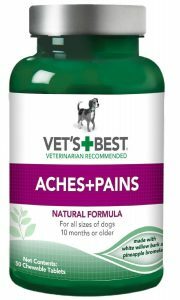 Vet’s Best Aches + Pains Dog Supplements offer an all-natural solution to quickly relieve sore muscles, stiff joints, and temporary discomfort. 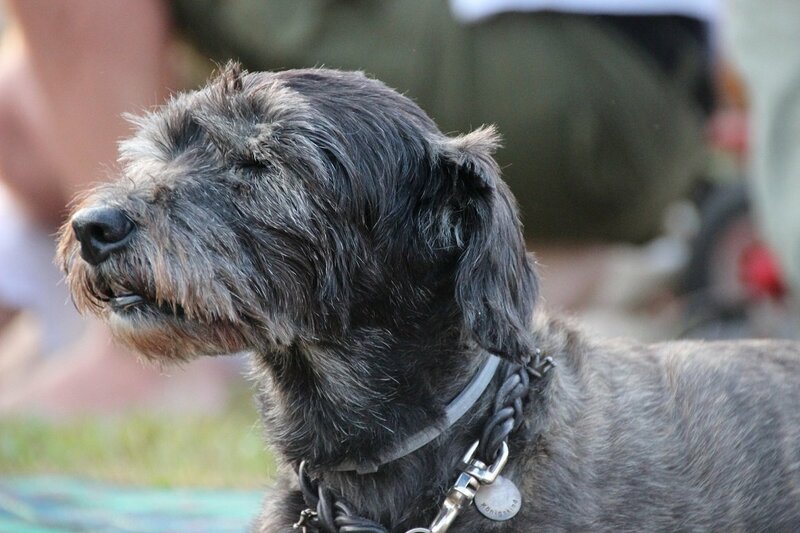 It’s an ideal choice for senior dogs as well as younger, highly active dogs. All Vet’s Best products are formulated by veterinarians with a thorough understanding of animal medicine, so you can trust that you’re using a safe, quality solution. This particular supplement is also approved by the National Animal Supplement Council (NASC). Natural, aspirin-free formula with white willow bark, MSM, pineapple bromelain, and glucosamine HCL. 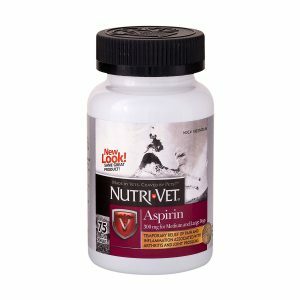 If you’re looking for a strong, aspirin-based pain reliever, I’d definitely recommend Nutri-Vet K9 Aspirin. 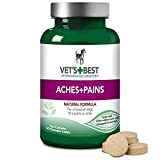 Each chewable tablet contains 300mg of aspirin to relieve pain and inflammation, and the liver flavor makes it easy to administer to your dog by mouth. All Nutri-Vet bone and joint supplements are engineered to bolster the structural integrity of your dog’s joints and connective tissues, so you’re not just treating the pain—you’re providing the nutrients they need to heal and grow stronger. These Extra Strength Hip & Joint chews do a great job of easing pain and inflammation while strengthening hips and joints. They’re a good choice for dogs with joint pain, arthritis, and hip dysplasia, but they can also be used as a supplement to prevent these problems, too. 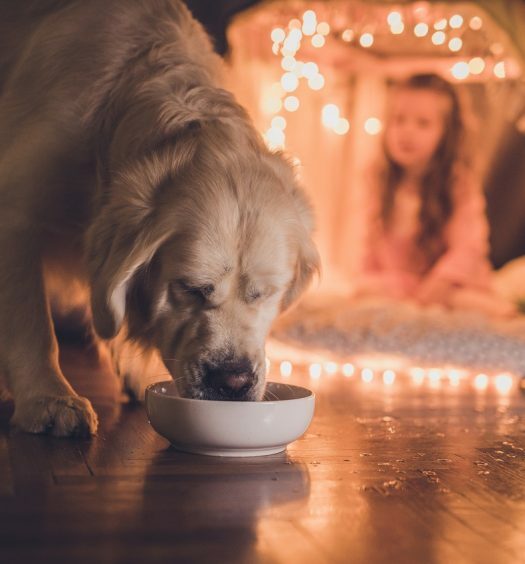 Feed them to your dog at the onset of any noticeable pain, stiff joints, or reduced mobility, and you’ll be amazed at how quickly the benefits kick in. Here’s another great all-natural supplement for pain relief. 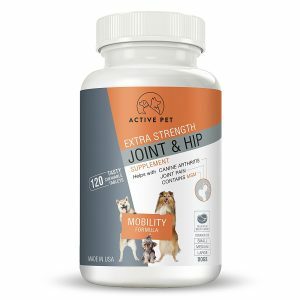 The ActivePet Extra Strength Joint & Hip Supplement is a beef-flavored chewable tablet that’s packed with MSM, glucosamine, and chondroitin. Like the other products that we’ve discussed, it works to naturally soothe pain and inflammation while strengthening joints to improve mobility. 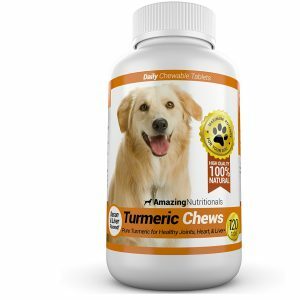 Amazing Nutritionals Turmeric Chews are a proprietary, custom-formulated doggy treat that provides a natural pain reliever with a holistic nutritional boost for dogs of every size and age. They’re made fresh in small batches in a GMP organic-certified facility, and all of the ingredients are tested by a third-party to ensure quality, purity, and accurate dosage. The primary ingredient is turmeric curcumin, a powerful antioxidant derived from pure turmeric root that has been proven to reduce painful joint inflammation and promote a healthy heart, liver, and joints. It packs a bacon and beef liver flavor that your dog will crave, and it’s a great treat for dogs with a sensitive stomach who can’t take pouches or pills. Each of these supplements come highly reviewed and widely recommended, so you can’t go wrong with any of them. I’d recommend getting the Nutri-Vet K9 Aspirin for emergencies (use sparingly) along with an all-natural supplement for daily use. A good all-natural solution should ease your dog’s pain while helping to strengthen their muscles, joints, and cartilage for better long-term mobility. 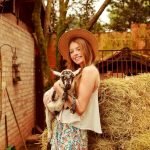 "I started Pets-Life last year with one goal in mind, to answer all the questions that I know busy pet owners have. I wanted to make buying new products for your pets quick and easy."